A Warm Winter Hat will Keep You Healthy! When wearing a hat for warmth, you will want to look for a hat that comes lower on the head than, say a fedora. Like a cloche, bucket hat, or slouchy beret. The weather is turning cooler and you’re all prepared. Warm coat, waterproof boots, and scarves and mittens all lined up. But wait – there is one very important article of clothing that will keep you warm and healthy this winter. Now just because you need a head covering to keep warm, that doesn’t mean you have to give up on the fashion aspect. Oh, no. Hats are a fashion statement all of their own! When wearing a hat for warmth, you will want to look for a hat that comes lower on the head than, say a fedora. Like a cloche, bucket hat, or slouchy beret. In addition, the warm winter fabrics such as wool, angora, tweeds, twills and knits will keep you cozy all season long. So have fun shopping for the perfect womens hats this winter – and remember… your health! How can a beret be worn? 1. 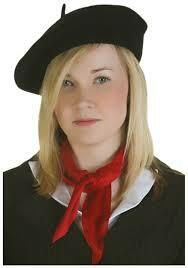 On an angle- Place the beret on your head and gently push one of the sides down to make it slant on an angle. This is a very comfortable and stylish way of wearing a beret. 2. Pulled down- Place the beret on the higher part of your head and take the front and gently pull it a little so that the front part will lay a little on your face. 3. Pan cake – Simply take the beret and put it on your head wherever feels most comfortable. Since a beret is round, it will lie on your head like a pancake. We see that the beret was and is worn by men and women – so is this a feminine hat or more of a masculine hat? Well, before WWI the beret was only worn by men and boys. However, after WWII, the beret became a hat worn mostly by women (men and boys however still wore them for uniform). Nowadays, the beret is mostly worn by women but men still wear it for a uniform. The beret can be made to look feminine or masculine; it all depends on the style, color and design.